Vostok is a famous brand in Russian horology, and one of the two official suppliers of watches to the Soviet armed forces (the other maker was Poljot). Both trace their roots to the First State Watch Factory founded in 1930 under orders from Stalin. The First State Watch Factory was renamed the First Moscow Watch Factory in 1943, which eventually became Poljot in 1964. The Vostok company was founded in 1942. One of the Moscow watch-making plants was evacuated to Tschistopolsky (Chistopol) in 1941, when the Germans were approaching Moscow. The company did not begin using the "Vostok" brand name until the 1960s. While I am at it, there was also another evacuation to a location behind the Urals. Factory 53 was a temporary watch factory (branch) of the Second Moscow watch factory from 1942 to 1946. Their signature was a diamond with the number '53' inside. At Tschistopolsky, mainly defense equipment was produced during the war years, but as soon as the war was over, the company started making mechanical wrist watches. The designation for the watch (not the movement) was K-43. The watch I have here was made at the Tschistopolsky Watch factory in the 3rd quarter of 1947. 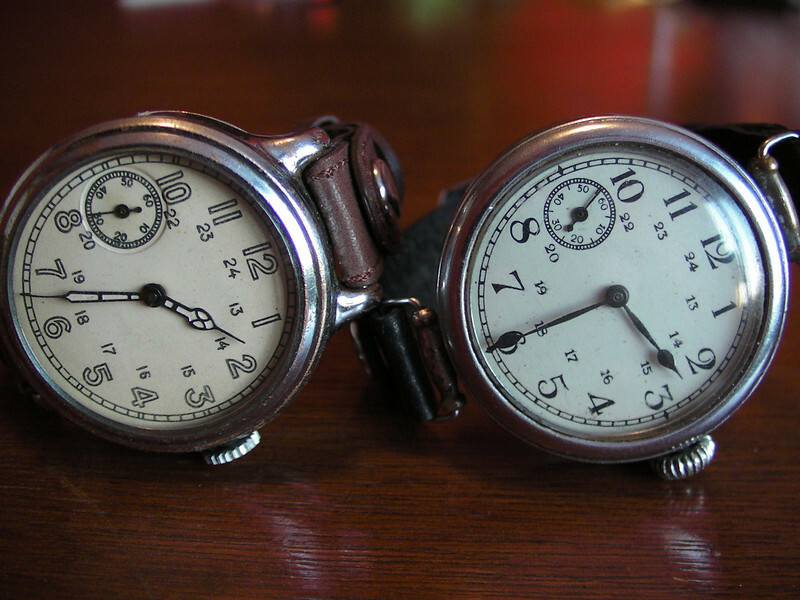 It would be one of the first watches to be produced at the factory after the war. The caliber is Chk-6, also known as ЧК-6 or YK-6 or Cheka 6 or pocket-watch 6. It is based on the grandfather of Soviet movements, the Type-1. The movement is signed with ЧК-6, 15 jewels, manufacturing date 3-47, the Tschistopolsky signature and the serial number. The ticking is very load; I can hear it on arms-length distance. The case is made of chrome plated brass, is 43 mm across, has fixed lugs, and the caseback is friction only – it can easily be removed without any tools. The same is true for the front of the case - the case has a slot for the stem (as opposed to a hole), so the whole movement can be extracted in seconds. That is what I call serviceability! 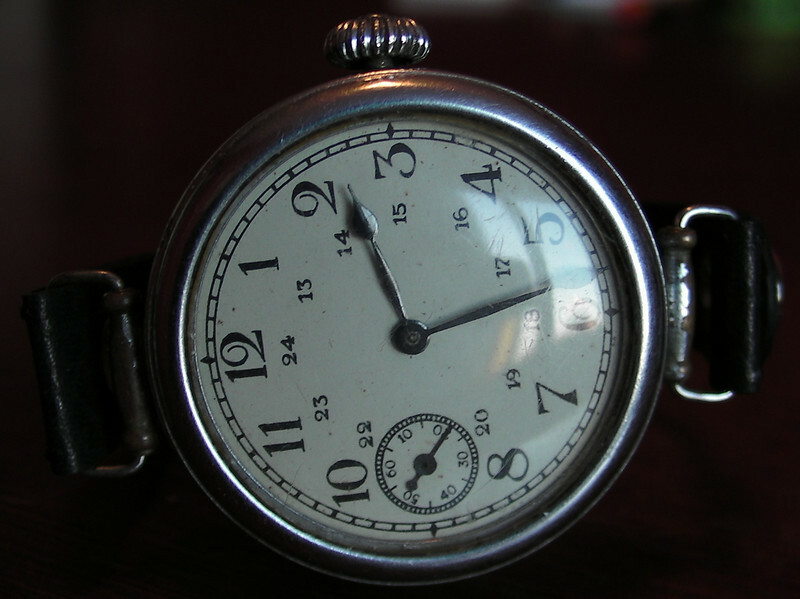 This type of case with the distinctive hollow lugs was introduced in Chistopol during the war for military issue watches. It has the nickname "saucepan" for obvious reasons. The dial is minimalistic, but correct for this type of watch. The hands have probable been repainted. There is something agricultural about the movement that I find attractive. Here you can see the slot for the stem. 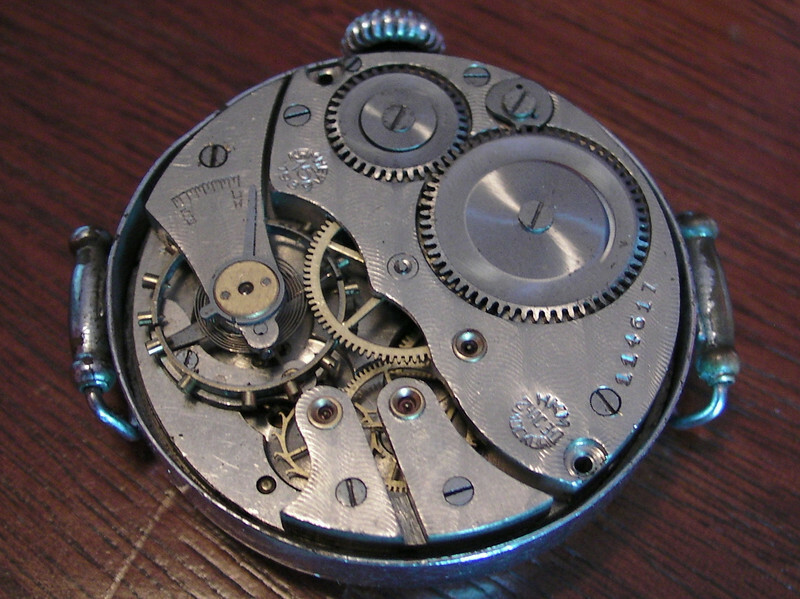 Here is another K-43 from 1939 with a Type-1 movement. 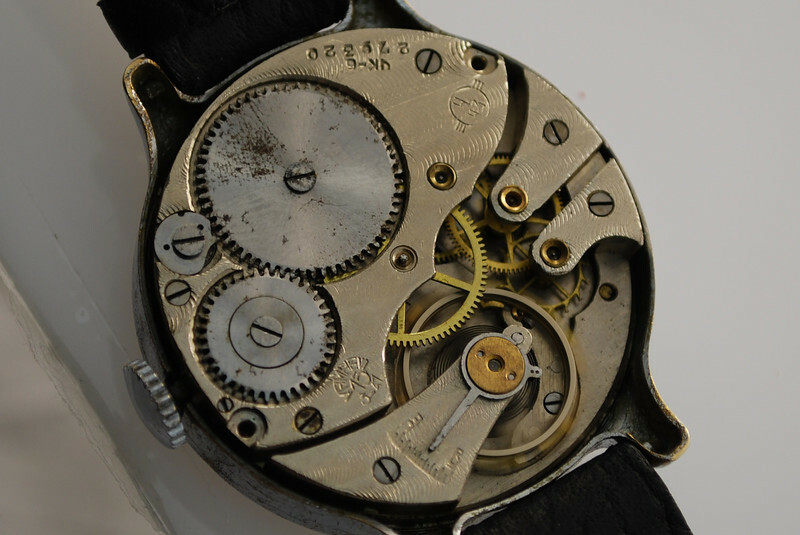 What makes it a little bit unusual is that it was made by the Second Moscow Watch Factory (2MWF), including the movement. 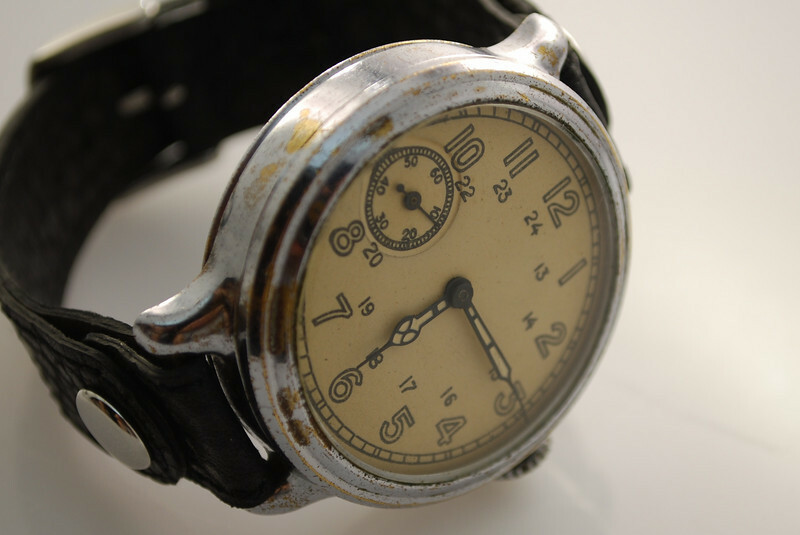 The reason for it to be unusual is that typically this factory was assembling watches with movement produced at the First Moscow Watch Factory (1MWF), and it was only during a couple of years (1938-1939) that Type-1 movements was made and signed by the 2MWF. Comparing it to the Tschistopolsky K-43, this one is eight years older, has the original Type-1 movement design, different dial and hands, and onion shaped crown. Similar to the Tschistopolsky, the case is made of chrome plated brass with a diameter of 43mm, but it has swing lugs, and takes a 16mm strap (as opposed to 18mm). One thing that I didn't thought possible; it is even loader. I just made an experiment: I took the watch to a reasonable silent room, away from noisy computers. I placed it in the window and walked to the other end of the room - I was still hearing the ticking clearly, 6 meters (18 ft) away! This watch has presence, that is for sure. Not bad looking for a 71 years old watch - maybe it was on duty on the eastern front during the Great Patriotic War (WWII). The movement is stamped with a serial number 114617, manufacturing date 1939 and inscriptions in Cyrillic: "15 jewels", "Moscow", "НКМ = Public Commissariat for Engineering" and "2ЧАС.З-Д" = the Second Moscow Watch Factory". Last edited by Lucidor; 19-02-2010 at 11:49. Fascinating post, Lars, about two very rare survivors. It's amazing that they survived at all, let alone in that condition - you are very lucky. 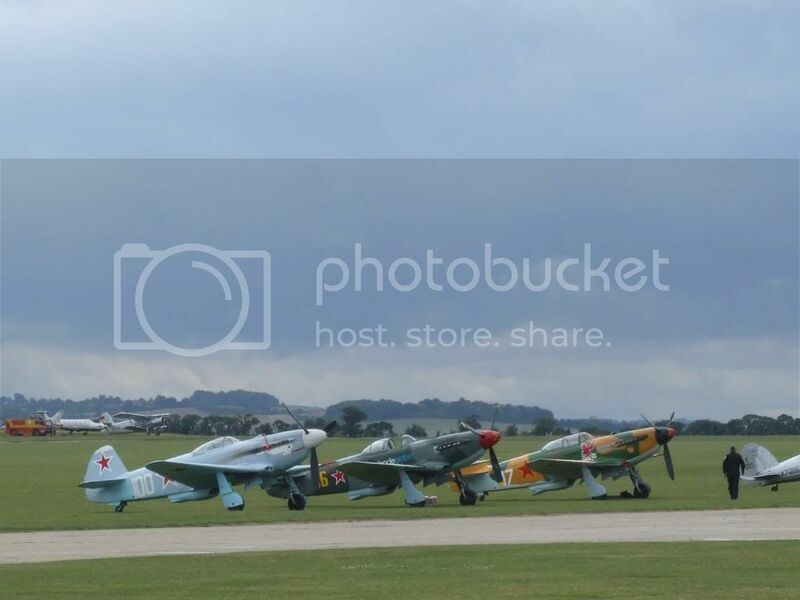 I guess there's a pretty good chance that at some point they spent some time airborne in Yaks like these? Thanks so much for posting. I've never seen anything like those watches before. Very, very interesting. I would say it is plausible, but these watches were not specific to the air force. It is my understanding that they were used by the navy and the army as well. 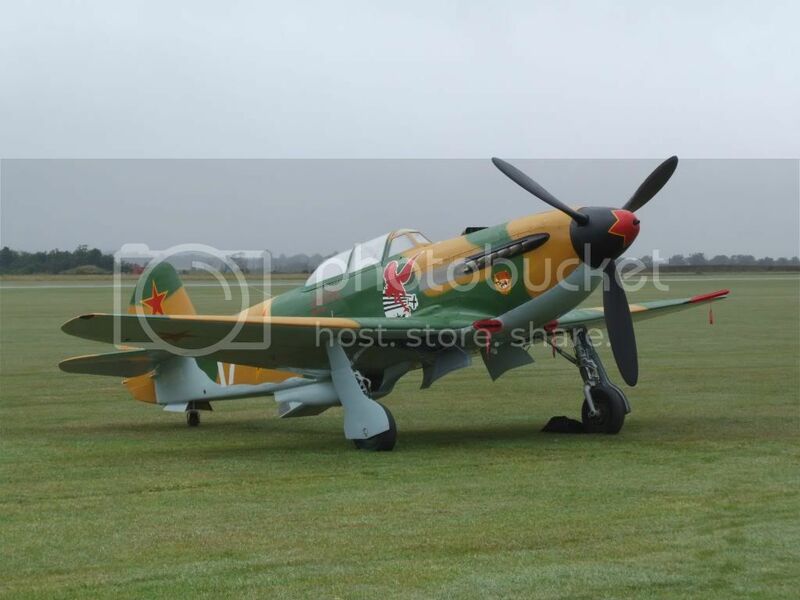 Lovely pictures of the Yaks though! I do however have a 1941 chronograph which I believe was intended specifically for pilots. I will make a separate post on that one soon. My photo sharing site seems to have problems and not all of the photos show up. Hopefully it will be corrected soon. Fascinating Lars, thanks for sharing. Need to add couple more Russki milwatches to my collection as well. Too true, Dan. There has been a huge increase in interest in them over the past year. If post counts here are any sort of barometer, it would seem that they are actually the most popular mil-watches of all at the moment?! Good quality examples like the ones belonging to Lars are very difficult to find though, as you know! Just to add on to the post, here's my Factory 53 example. I was taking my other Type-1 apart. I notice something, the same movement serial number, "12776", can be found on the balance c-ock (it's a censored word ! ) and balance wheel.